Singapore, 22 August 2011 – In celebration of the upcoming 2011 FORMULA 1 SINGTEL SINGAPORE GRAND PRIX, race promoter Singapore GP Pte Ltd will be hosting a fundraising gala premiere of SENNA the movie on 13 September. Proceeds from the gala premiere will be donated to President's Challenge 2011. SENNA chronicles the triple world champion Formula One driver Ayrton Senna's remarkable story, charting his physical and spiritual achievements on the track and off, providing an unprecedented insight into the dramas and controversies surrounding the charismatic Brazilian. The documentary spans the racing legend's years as a Formula One driver from his opening season with Toleman Motosport in 1984, to his untimely death a decade later at the San Marino Grand Prix. Since its release late last year, SENNA has proved to be a phenomenon. In Europe, in just two months it became the highest-grossing documentary film ever. In the United States of America, it was awarded the "2011 World Cinema Documentary Audience Award" at the prestigious Sundance Festival and the "2011 Audience Award for Best International Feature" at the Los Angeles Film Festival. Over in Australia, it won the "Audience Award for Best Documentary in World Cinema" at the Adelaide Film Festival. The film was made in full co-operation of Senna's family, Formula One Management – who provided previously unseen footage, as well as Instituto Ayrton Senna, a charitable foundation founded after his death, which has since provided the education for over 12 million underprivileged Brazilian children. SENNA is written by Manish Pandey, directed by BAFTA award-winner Asif Kapadia and produced by Working Title, whose other notable films include 'Billy Elliot' and 'Notting Hill'. Pandey, who is also the Executive Producer of the film, will attend the fundraising gala premiere and participate in a question and answer session with the audience. This gala premiere would not be possible without the generous support from Universal Pictures and Mumm Champagne. "Ayrton's death was a huge loss to the motorsport community and this film tells his story beautifully. 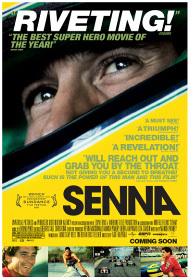 With almost a month to the 2011 FORMULA 1 SINGTEL SINGAPORE GRAND PRIX, this movie could not have come at a better time. I'm excited to provide local fans with the opportunity to revisit history, while doing their part for President's Challenge 2011," said Colin Syn, Deputy Chairman of Singapore GP Pte Ltd.